Israeli tanks, helicopters and planes have struck Gaza after an anti-tank missile fired from the Palestinian territory hit a bus in southern Israel. A teenaged boy on the bus was critically injured and the driver was also wounded. Four people were killed and some 35 injured in the Israeli strikes, Gaza hospital officials said. Later reports said Islamist movement Hamas had announced a ceasefire in an attempt to halt the violence. Hamas officials and the Palestinian observer mission said the truce went into effect at 2300 local time (2000 GMT). Israel meanwhile said it had successfully used a new missile-defence system for the first time. Two missiles fired from Gaza in the direction of the city of Ashkelon were destroyed in mid-flight by an Israeli interceptor missile. "Our Iron Dome anti-missile system intercepted two projectiles successfully," Israeli Prime Minister Benjamin Netanyahu said. 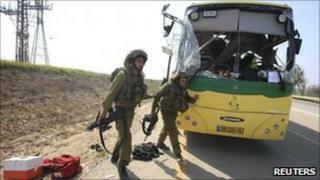 The military wing of Hamas said it carried out the bus attack. It said this was a response to the killing of three Hamas members in Israeli strikes earlier this week. Reports say 45 mortars were fired from Gaza into Israel. Following the bus attack, an Israeli plane bombed a compound in northern Gaza belonging to Hamas. Targets in Gaza City and Rafah were also hit. Helicopters also machine-gunned a target in Gaza for the first time since Israel's offensive more than two years ago, the Reuters news agency reports. All senior Hamas figures are believed to have gone into hiding in expectation of further Israeli strikes. Driving into Gaza City from the border, loud explosions could be heard. A huge plume of black smoke rose up to the north from an apparent Israeli air strike. Ambulances overtook us, speeding the injured to Shifa hospital. This looks like another potentially dangerous escalation, and a reminder that the Gaza-Israel conflict has not gone away. Militarily, Israel is far superior, a fact which is reflected in the casualty figures. Both Hamas and Israel have recently said they wanted a return to calm. But both are under pressure from their constituents to act. Israel, where casualties are rare, is under pressure from its border communities to punish militants in Gaza for any attacks. Hamas is under pressure from its militant wing and other armed groups in Gaza to respond forcefully. Both sides seem unable to see the other's perspective. The bus attackers used an anti-tank missile, the Israeli army said - the first time such a weapon had been used against an Israeli civilian target. The bus had been dropping off schoolchildren near the Nahal Oz kibbutz, and was carrying only one passenger when it was hit, Israeli medical sources said. A 16-year-old boy suffered a serious head wound and was taken to hospital for surgery. Mr Netanyahu said Israel would take any action necessary to deter attacks from Gaza. "We hope this situation will be contained but we will not shy away from taking all the necessary action, offensive and defensive, to protect our country and to protect our citizens," said Mr Netanyahu during a visit to Prague. Palestinian President Mahmoud Abbas urged Western powers to intervene, but also urged militants not to give Israel an excuse to hit Gaza. Mr Abbas called on the West "to immediately intervene to stop this aggression", the official Wafa news agency reported. The US State Department condemned the Palestinian militants' attack. Spokesman Mark Toner said there was "no justification of the targeting of innocent civilians." Earlier on Thursday, Israel carried out air strikes against smuggling in the south of the Gaza Strip. Last month saw some of the worst violence since Israel launched Operation Cast Lead in Gaza in December 2008, says the BBC's Jon Donnison in Gaza. In one week in March, at least 10 Palestinians - including several civilians and children - were killed by Israeli attacks. In the same period, militants in Gaza fired more than 80 rockets and mortar shells into southern Israel. Hamas had pledged to try to restore a unilateral ceasefire that it said ended on 16 March when an Israeli air strike killed two of its militants in the Palestinian territory. However, Israel said it had suffered "bouts of terror and rocket attacks". Despite recent calls for calm, neither side seems to be able to stop firing, our correspondent says. Both say the other started it. Israel says it holds Hamas responsible for all attacks coming out of Palestinian territory, even if it is other militant groups carrying them out.